Car of suspected jewelry thieves attempts to break police barrier, runs over two cops. One suspect shot in head, another injured. 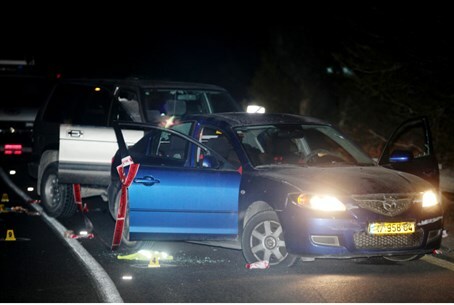 Police opened fire on a car of suspected thieves as they attempted to break through a police barrier Tuesday afternoon in the Galilee, running over two police officers in the process. The officers were moderately wounded, and evacuated to Ziv Hospital in Tzfat. Shots were fired as the car ran through the barrier on highway 85. Of the suspects - four men in their 20s from Tiberias - one was shot in the head and left mortally wounded. The 25 year old was evacuated to Ziv Hospital, along with another suspect whose received unspecified injuries to his limbs. According to police reports, the suspects apparently broke into several houses in Tzfat and Hatzor before the showdown with police. What appears to be stolen jewelry was found on their possession. Chief Police Superintendent Amal Khalil, Head of the Northern Command's Investigative Department, described the event to Walla!, relating how the police barrier was erected as part of routine anti-theft measures. "At a certain point Yasam (SWAT) officers at the barrier received information about the car suspected of criminal activity being in the area," reported Khalil. "When the suspected car identified the barrier it began driving wildly." At this point the car damaged several vehicles, hitting a truck, several civilian cars, and eventually two police cars as it broke through the barrier. "One of the officers succeeded in opening the car's door and grabbing one of the suspects, although the car continued driving, dragging the officer along and running over his legs," added Khalil. "The car also injured the hand of another officer." "The officer who was dragged along fired into the car with his handgun, even as the car continued trying to escape, turning right onto a road leading along the path of Nahal Amud (a stream in the Galilee) - a bumpy dirt road full of holes and pits," relayed Khalil. The car continued its rampage down the road, until finally veering off it into a thicket of trees. The suspects, except for the critically injured one, stepped out of the car and began running away by foot, but they were soon captured by police. Details of the incident were transferred to the Police Investigative Unit to check the circumstances of police fire and police management of the case. The suspects, who have previous convictions for car theft, were turned over to investigators in the Northern Command's Central Unit offices in Nazereth.